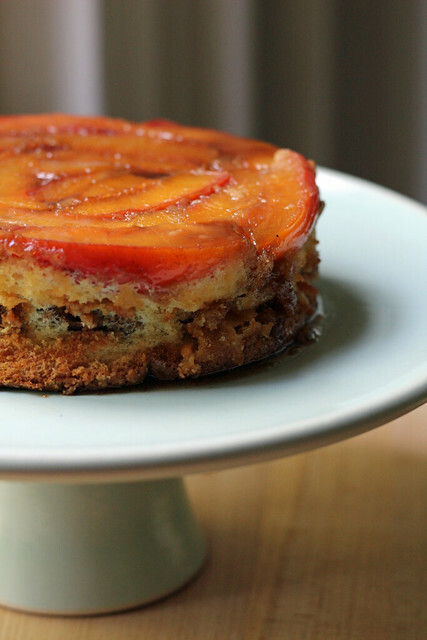 It’s Fridays with Dorie for me this week with Mary Bergin’s fabulous Nectarine Upside-Down Chiffon Cake. I made, and ate, this cake a couple of weekends ago. Then I was so excited to go Montreal for Labor Day weekend, I didn’t post. We came home and I still didn’t post, because I’ve been too busy looking at Montreal real estate websites and daydreaming about living there!! This recipe is in a section in the book called “Everyday Delights” but I think it’s pretty fancy. It’s not just a standard-issue tinned fruit upside-down cake. Underneath the glistening fresh nectarines is a light chiffon cake bisected by a layer of crispy almond streusel. It’s a bit of work to pull off, but I thought it was worth every bite. And really, the streusel could be skipped to save a step…it would be just as good, I think. I had good success with this chiffon. I was a little worried when I saw the batter almost totally filled my springform, and it did mushroom up in the oven. But nothing overflowed, thank goodness. If you are worried, I’d suggest taking out a couple scoops and making them into cupcakes or something. It was kinda hard to tell if the cake was done, and I think I left it in the oven a few extra miinutes. When making chiffons, the cake pans are often ungreased so the batter can really climb up the sides. I’ve learned to (gingerly!) run a thin knife around the edges of the pans about five to ten minutes after the cakes have come out of the oven. This helps the cakes to not tear away from the sides as they start to cool, which I think can cause them to sink a bit. For the recipe, see Baking with Julia by Dorie Greenspan or read Marlise’s The Double Trouble Kitchen and Susan’s The Little French Bakery. There’s also a video of Julia and Mary baking this together. Don’t forget to check out the rest of the TWD Blogroll! Nice tips…this looks fantastic. I still don’t have mine done, but I am planning on making it. It’s been that kind of week. A sort of cake-free week around here I guess, but the weekend should call for a cake, right? A small one. Very nice. Stunning photo, as always. Umm this looks amazing. Def going to try this! Looks yummy, especially the almond streusel layer. wow that is gorgeous and looks yummy. Steph – you cake is beautiful! Looks perfect. Fun to make! 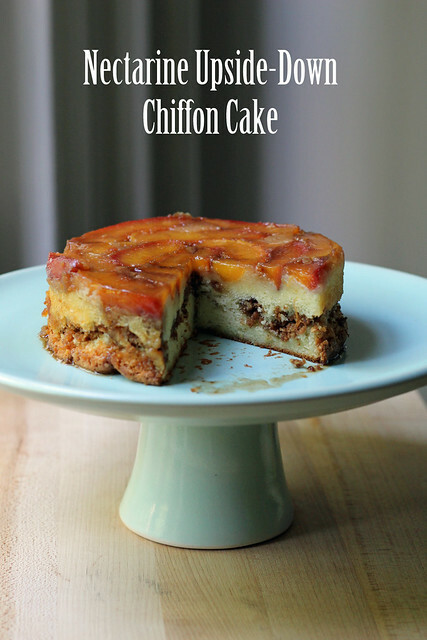 This nectarine upside-down chiffon looks beautiful and very delicious. I think I’m going to buy Dorie’s book just for this recipe.